Daisy Appleby has lived 5 different lives. Each time she has to change her last name and move to a new city. That's because Daisy is part of a scientific experiment, classified "Revived". Daisy and 10 other participants were found dead in a bus crash, before being injected with the drug Revive. Now they are monitored by scientists and lead quiet lives, hiding their secret. After her last "death" Daisy moves to a new city and finds herself bonding with Audrey and Matt. For the first time she's made best friends, but guilt gnaws continues to gnaw at her as their relationship grows closer. Instead, Daisy has to choose whether to stick to her usual routine or live a normal teenage life. I was very much a fan of Cat Patrick's previous novel, Forgotten, so I decided to pick this up and hope she would entertain me again. Patrick has great ideas behind her stories and they pose as very unique as well. 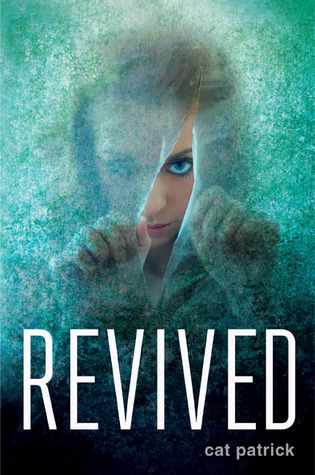 Revived does have an interesting premise, but it fell a little flat compared to my expectations. I think the main issue that Patrick tried to cram too much into it such a short novel. I was left feeling a little unsatisfied because it missed the mark with most things. I had a lot of trouble connecting with the characters, even Daisy. I think a lot of it was to do with the fact that whilst I was reading through Daisy's perspective, I didn't really spend a lot of "time" with her. I didn't get much of a backstory besides the bus crash, so already she seemed a little 2D. Her best friend Audrey had a bit more character and her personality was admirable. Except she seemed like more of a vehicle to drive a certain message for the novel. There was very little relationship development between Matt and Daisy as well. A lot relied on me having to believe Matt really did like her, because it was basically insta-love. They hung out a couple of times and it felt "right". Matt as a character was cute, he was the typical male character who was good looking, smart and caring. You can't help but not like him. Yet, while I was reading, I actually thought they were a lot older than their own age. Daisy is only 15 but her and Matt's "love" sounded really intense for a high school romance. I only took Daisy's affections as a crush, so I was little confused. What I did like though, was the questions raised about humanity. I thought the story did great in conveying the negative side to certain privileges and power abuse. It really made me think in terms of who has rights and who calls the shots. More importantly, it places emphasis on acknowledging what is wrong and working towards fixing that - even if it is just one individual at first. Revived was by no means an exceptional story. It fell flat at some points but it wasn't as forgettable as I thought it would be (I read this last month!). Patrick's writing makes it a lot more bearable, because she can create right tensions and some plot twists. Check it out for yourself?